The Gould & Goodrich Model 890 holster is a compact design intended for inside-the-waistband carry. It is made from genuine top grain, vegetable tanned leather in black or tan, making it very strong and allowing it to mold to your body over time for comfort. The soft inner layer won't damage your weapon's finish. The open top design leaves the grip of your pistol fully exposed, allowing a fast and natural draw so that you can react immediately to emerging threats. The holster comes with a clip that attaches to your pants, skirt or belt, and fits a belt up to 1.75 inches wide. Excellent quality. Had very little break-in time before my xd-9 would enter and exit the holster smoothly, which was nice. For the price, you could not find a better holster. For the money an excellent holster. Holds the weapon securely and does not "print". Is the belt clip spring steel? Has there been any problems with the clip, breakage, loss of strength etc? Steel clip. 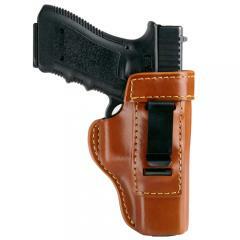 I have not heard any reports from customers regarding any issues or problems with this holster. Is this holster (Model 890) form molded to the LCR when made? Yes, it is molded to the LCR.